Question: What’s the difference between paste-like floatants (Gink, etc.) and the crystals, where you have to shake the fly in the stuff? 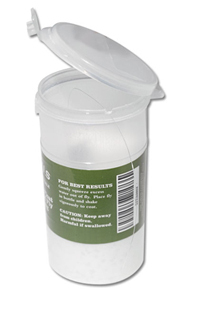 Desiccant usually comes in a plastic cannister that features a notch in the edge through which you put your tippet. Close the lid, and shake away. Photo courtesy of Orvis. Answer: Fly floatants come in many forms—paste, liquid, gel, etc. —and are designed to keep the materials in your fly from absorbing water. These products work best when they are applied to a fly that is totally dry, usually right when you take it out of your fly box and tie it on. If you catch a couple of fish or if you’re fishing in rough water that frequently sinks the fly, these kinds of floatants eventually stop working. A waterlogged fly doesn’t float, so you need to either change the fly or get the water out of it somehow. The other downside of pastes and gels is that it’s possible to use too much, which causes the hairs or feathers of the fly to stick together. This can make the fly less buoyant, and it may make an imitation seem less natural. Once you’ve over-gelled a fly, all you can do is let it fully dry before you can pull the fibers or hairs apart again. 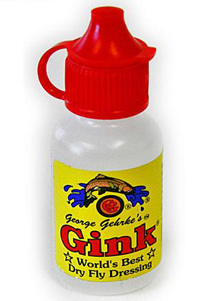 Gink has been around for almost 30 years, and the name has become a generic term for paste floatants. Most of the crystalline products are desiccants, meaning that they actually removemoisture from the fly. You take your soggy fly, put it in a small canister with the crystals, and give the whole thing a hearty shake. When you pull the fly out, it is magically dry—but covered in white crystals, so you need to blow on it or shake the white stuff off. Desiccants work best for larger, fluffier patterns, such as stoneflies and Wulffs and the like. Eventually, a fly may become waterlogged enough that desiccant can’t revive it, in which case it’s time to change flies. I like to use both floatant and desiccant for fishing rough-and-tumble waters. The floatant gets your fly floating right off the bat, and the desiccant restores the fly quickly when it becomes waterlogged, allowing you to get right back to fishing. There are also several dry-fly dressings, such as Water Shed and Hydrostop, meant to be applied long before you are on the water. These products are often called “permanent floatants,” and they literally waterproof flies by adding a coating to the patterns.